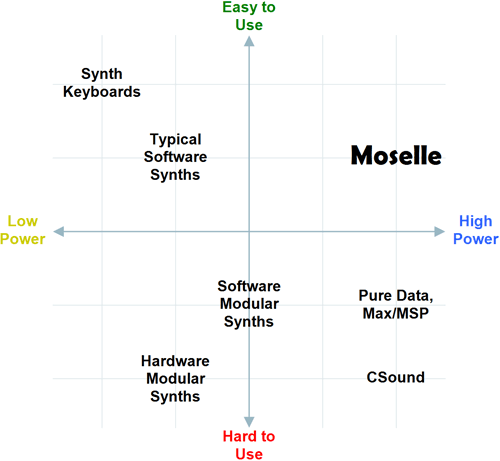 MoselleIDE is a stand-alone program; nothing else to install or configure (other than hooking up a MIDI keyboard). The fully-functional IDE is free to download. MoselleVST will be announced in 2018, to allow you to easily use the power of Moselle in your DAW. Moselle isn't quite finished yet, so why would anyone try it now? and it's free, so why not? How Can You Patch a Synthesizer with a Computer Language? Any knob on physical synthesizer is probably an input variable in Moselle, as seen above with Waveform. If you don't specifically say what a given input variable is set to, you get a standard default value. For instance if you don't mention Waveform, you get a sawtooth by default. Any input jack on a modular synth is also an input variable. For instance, Moselle's Oscillator has an input called Frequency. A modular synth would have an input jack to control this, in addition to, probably, a built-in knob. That equation, Input = Oscillator:Output, is exactly like a patch cord from the oscillator's output to the filter's input. What if we want two oscillators? Moselle lets us name modules however we want. We can call oscillators A and B, Carrier and Modulator, anything we want. Let's call them Oscillator1 and Oscillator2. Let's set the second oscillator's frequency to be the same as the first, plus two cents. (Cent is a musical term for 1/100 of a semitone.) Then let's send both their outputs into the filter. Now what if we wanted oscillator 2 to be inaudible at low velocity, but full volume at high velocity? Each Voice played has a Velocity that, mathematically, goes from 0 to 1 (not the 1 to 127 seen in MIDI). The simplest and most obvious way to accomplish our goal would be to simply multiply the oscillator's output with the velocity. The above examples may not look too complex, but that is about the complexity it'd take to duplicate most physical synthesizers. You could write a lot of innovative patches without writing any more complicated formulas than that. However, Moselle can easily handle much more complicated formulas if you need them. The following formula is just a part of the emulation of the Casio CZ Synthesizer, which Moselle ships with. 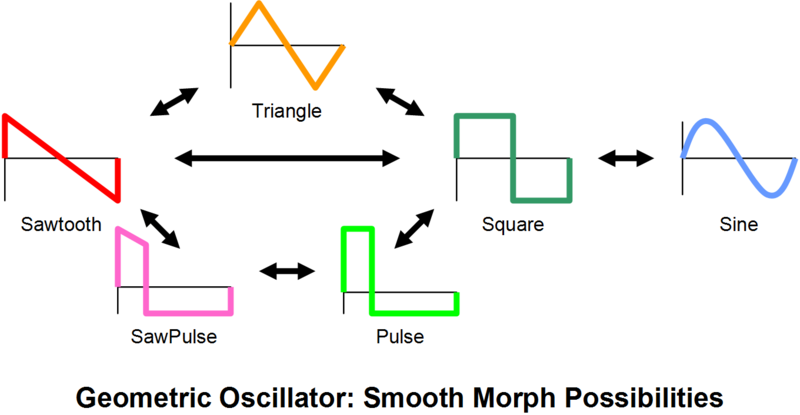 Geometric Oscillator. The usual Sawtooth, Triangle, Square, Sine waves. Also can morph (not just fade!) between seven pairs of waveforms (see diagram). SawPulse and Sine have pulse width in addition to the usual Square Wave. Full sync-in/out. Capable of FM. Calculates phase with floating point accuracy for massively reduced aliasing. Stored Waveform Oscillator. Bandwidth-limited for very clean sound. Can be programmed individually harmonic by harmonic and note by note, either from scratch, or by tweaking a basic Sawtooth, Triangle or Square wave. Does Sawtooth to Triangle morphs. Square wave has pulse width. Full sync-in/out. Capable of FM. Aliasing-free. Swarm. Generates thousands of detuned waves. Wavetable Oscillator. Supports Wavetable Synthesis like PPG and Ensoniq keyboards are famous for. Also allows Wave Sequencing, Grooves, Multisampling, and Vector Synthesis. Aliasing-free. Adder. Specialized for additive synthesis. FMAlgo. Specialized for FM synthesis. No limit to number of operators, operators with feedback, and design any algorithm you want. LFO and LFSWO. Similar features to the Geometric Oscillator and SWO, for low-frequency modulation. 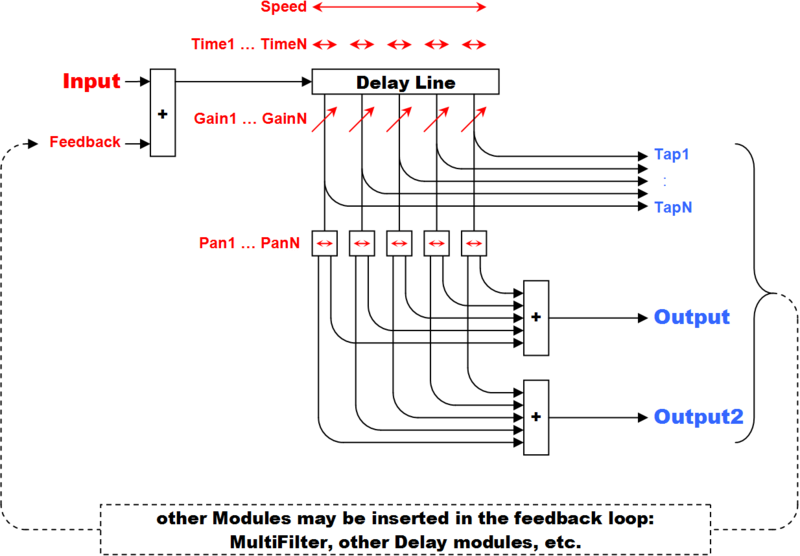 Filters, filters, filters: Butterworth, simulations of Moog, etc. support cutoff, resonance, variable pole count, and in some types, variable drive and/or self-oscillation. Low-pass, high-pass, band-pass and band-reject. Multi-filter: a box to be filled with any of dozens of filter types, to build graphic EQ, parametric EQ, simple tone controls, and phasers. Tutorial patches show you how. 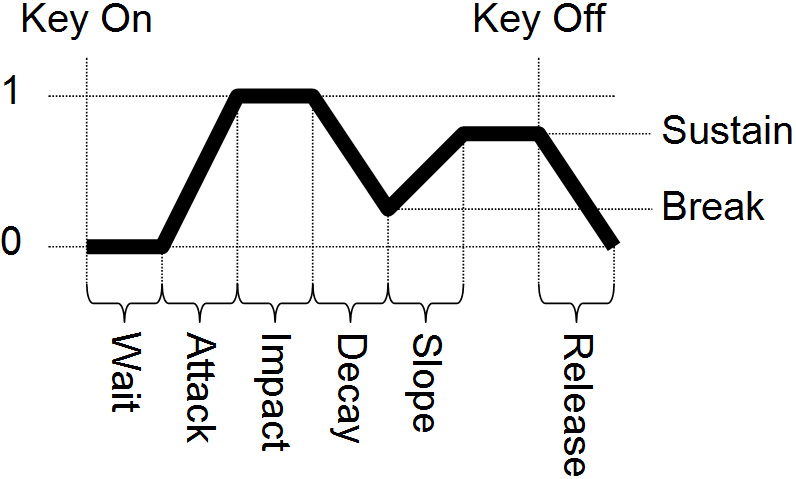 ADSR Envelope. Has additional wait, impact, break and slope parameters for WAIDBPSR if you want them, but can make sense of any subset too. (e.g. : for a vibrato that fades in, use an envelope with just wait and attack segments.) Outputs for linear, exponential, audio, and custom curves. Systematic Envelope. Supports an arbitrary number of level/time pairs with customizable curves. Each point has wait, start, goto conditions. Works fine in audio-domain as an oscillator, and can be used as an LFO or sequencer. Delay Line. Supports multiple time-variable taps. Can be used for delay, echo, reverb, reverse reverb, chorusing, flanging, etc. Tuning tables. Supports Equal Temperament, Just Intonation, any historical tuning or experimental tuning, quarter-tones, backwards keyboards. Have multiple per patch if you want (for instance to modulate between keys while using just intonation). Maps. These can be used at audio frequencies for waveshaping of oscillators and LFOs. 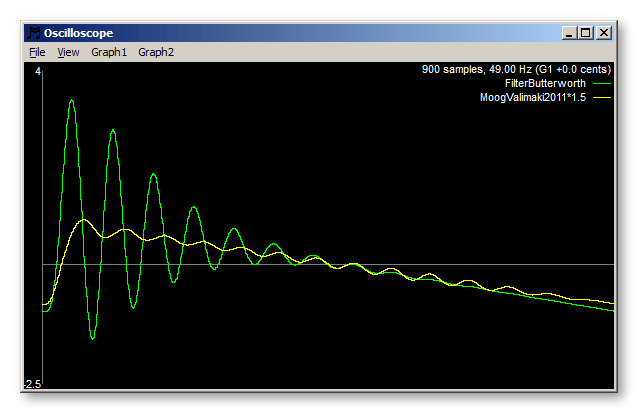 Also can be used for modifying response curve of MIDI controls, etc. Sample-and-Hold. Works fine for modulation signals (such as 80's burbling filters). Can also be used at audio frequencies. Besides the hold output itself, it also outputs its internal phase and a signal that it's just re-sampled the input. Portamento. Wired in place by default, just turn it on. Slew. 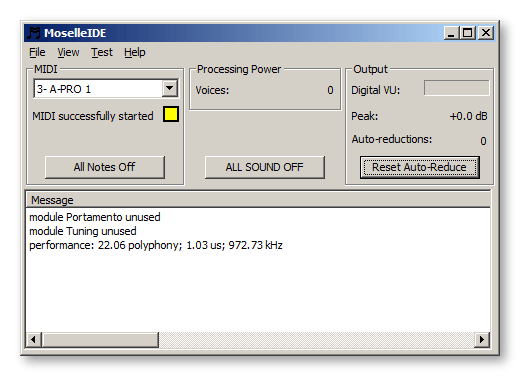 Like Portamento but for anything else, from smoothing modulation signals to audio frequency. Global. This holds master tuning, sampling frequency and so on. Patch. This sets overall controls for the patch, such as number of voices. Channel. This provides access to pitch wheel, channel pressure, and every other MIDI controller. Note. This provides all the data for the given note: which note played, velocity, release and release velocity, and so on. Pitch. This conveniently packages coordination of tuning tables and portamento; pitch bend; vibrato; octave, transpose, detune; unison detune. Voice. The ultimate destination for your output waveforms. Oscilloscope. This takes input variables describing what signals to graph and when to start collecting data and when to graph it. 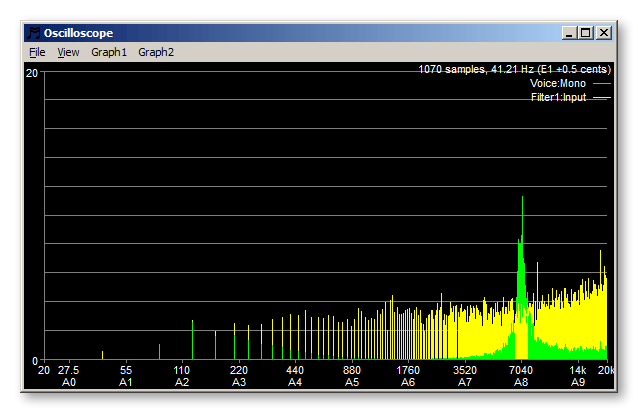 Can show you Real-Time Spectrum Analysis of your patch as you play. The Envelope lets you only specify the parameters you need. For an LFO fade in, for instance, you might only need Wait and Attack. 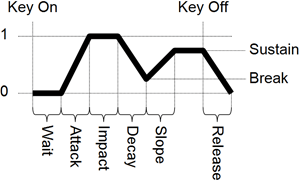 For standard synthesizer patches' volume, you'll use Attack Decay Sustain Release. But you can use all eight of these "standard" parameters if you need. If that is still not enough, switch to the "Systematic" notation, which has no limit to the number of segments. The Delay module lets you do everything from echoes to reverb, reverse reverb, chorusing and flanging. It's multi-tap, so you can do a quadruple chorus with an echo, all with just one Delay, if you want. If you want more Delays, though, help yourself. 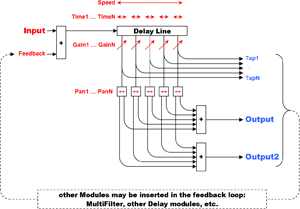 There is no fixed maximum number of Delays, or any other module type, available. Some other software modular synthesizers seem to have huge numbers of modules. Just as one example, the Nord Modular G2 claims 160 module types. Moselle currently has less than two dozen. The raw count doesn't tell you much about power, though. Oscillator 17 kinds 6 kinds Of the G2's 17, only 2 do a job that can't currently be done by Moselle's five main Oscillator types, the Noise module, or the Delay module. Envelope 9 kinds 1 kind Moselle's envelope can do far more. LFO 4 kinds 2 kinds Moselle's LFO does everything the G2's four do. Then the LFSWO does yet more. Level 13 kinds not needed Three of the G2's modules are used for processing external signals, and Moselle will have similar modules once it too has signal processing. The remaining 10 kinds of "level" modules can be duplicated precisely by simple math in Moselle. Or to take another example: the Sonic Core Scope Modular IV claims "around 300 module (types)." Among those are "7 CZ oscillators in the style of the well known CZ synthesizer series." Moselle can accurately emulate a CZ too, but doesn't need dedicated modules to do it. Instead, the basic modules, combined with a bit of math, are powerful enough to emulate the CZ by themselves. It is not actually to Modular IV's credit that it needs additional built-in module types for this. 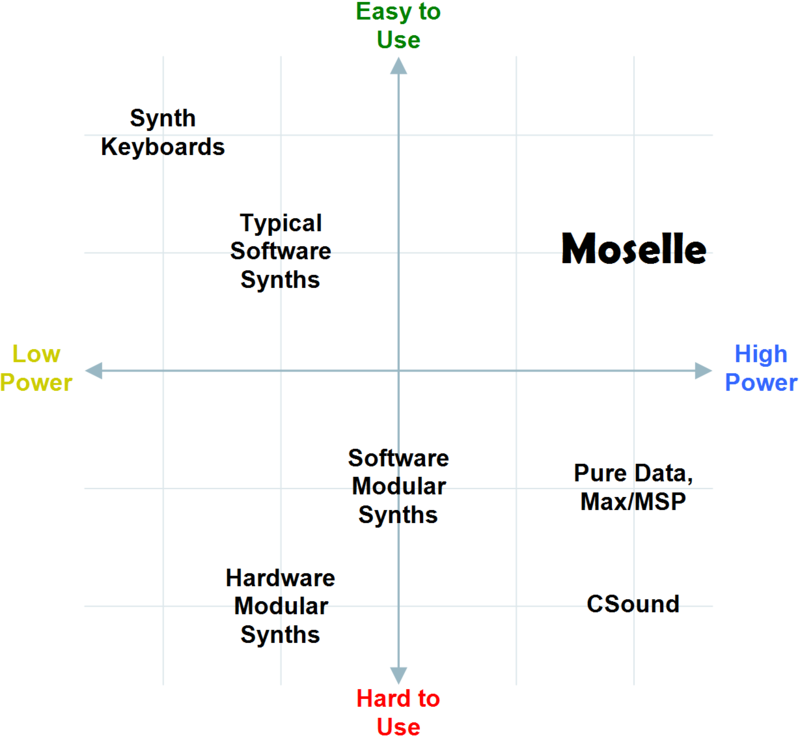 Also, please note that many of Moselle's modules can act like other types of modules. For instance, you can use Noise plus Delay to make a different kind of oscillator. Or a self-resonating Filter. Or set an Envelope to loop at audio frequency. You can build a complex waveform harmonic by harmonic with the Stored-Waveform Oscillator, but then use it as an LFO, and so on. So the smaller number of modules needn't be limiting. Finally, remember that Moselle is still at the "alpha" stage. By the time it's considered "Production Quality" it will have substantially more built-in module types. You can combine multiple modules into a reusable package. The package can then be used from patches exactly like the built-in modules. More example packages are planned for the production release, but the current "alpha" release has the following packages. As with patches, though, the point with Moselle isn't the factory packages it ships with, but your ability to write your own. 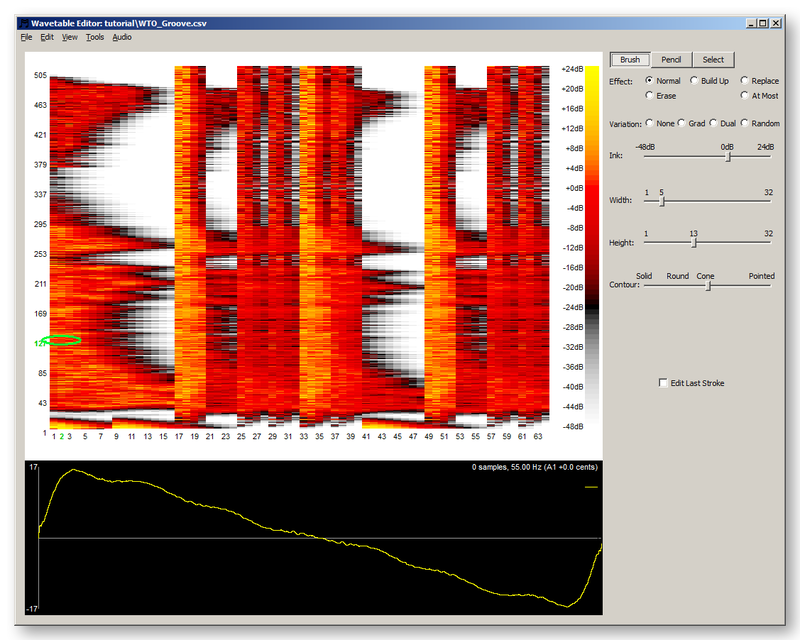 LeslieSimulator simulator, with separately-rotating high and low frequency speakers with separate fast and slow rotation speeds and configurable rise/fall times; internally it contains Delays, Filters, LFOs, Slews, etc. ... or combine multiple patches into layers or splits or velocity-fades etc. Complicated example: We can make a "horn section" patch out of three different brass patches, that automatically play a 3-part smart harmony, with half the keyboard harmonizing in Cmaj/Amin, and half in Fmaj/Dmin. When we wrote the original sax, trumpet, and trombone patches, we may not have pictured ever using them like this, but it doesn't matter. There's nothing special the base patches need to do to be usable in this way. This list roughly corresponds to the planned "alpha" releases going forward. Along with these main topics, every release should include a few more module types and of course bug fixes. 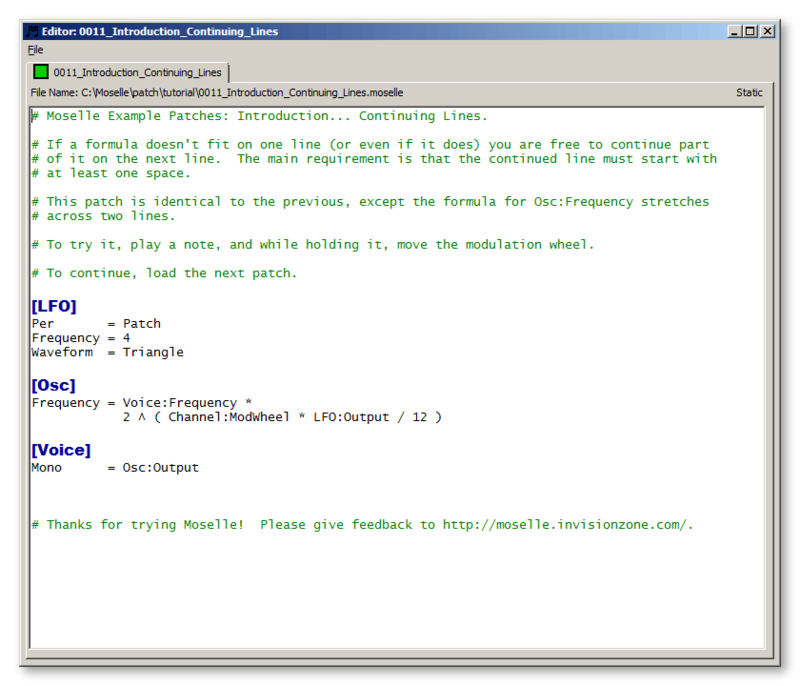 After the above projects are done, any patch you write with Moselle should continue to work for the foreseeable future. "Alpha" Release: handle sound inputs, allowing Moselle to act as an effect processor. This release will also have Pitch Detection, Envelope Follower, and the like. while also making it the easiest of the full-power synthesizers for writing, studying, and modifying patches of medium and higher complexity. When we measure power, we're talking specifically about building sound patches, not doing things like running light shows or doing algorithmic composing. While some competitors do some things that Moselle doesn't try to, this is actually purposeful. Moselle isn't built to be a jack of all trades, it's built to be a master of one: making patches. Synth Keyboards can't be beat for simplicity. Bring it in and turn it on. Hook up an amp and play. They are also the least-powerful synthesizers. A Jupiter-8 has about 40 parameters to control. A V-Synth GT maybe 200. But even the V-Synth GT is almost totally hardwired. You can't add one more oscillator no matter how much you need it. You can't define an envelope with one extra segment. You can't make pitch bend depend on note, or run an LFO through a filter. Typical Software Synths are either copies of hardware, or meant to look and act as if they are. Despite the massive creativity of the musician, and the massive power of the computer, you're limited to the tiny range of parameters they thought to give you control over. They fail at the same kinds of features listed above that the modern keyboards can't do. Hardware Modular Synths look like the ultimate in power, but they're not even half-way there. In theory, you can do anything you want. Need 50 oscillators? You could get them! In practice, you cannot afford 50 oscillators. You don't have room for them. By the time you've got the last in tune the first is out of tune. They also fall down for being (as a rule) monophonic, being impossible to move, and impossible to quickly change patches on. Software Modular Synths such as Reaktor remedy the portability and program-change problems. Some may be polyphonic, and they may support endless numbers of modules if you need them. Sounds good! The drawback is that they give you a photo-realistic picture of a modular synthesizer (or some type of diagram representing the same), and the number of cables becomes impossible to follow as the sound design grows more complex. This makes debugging patches, studying them, later tweaking them, and so on, quite problematic. Pure Data or Max/MSP Programming. What does this do? Is it even a sound patch? (Yes it is, apparently.) Graphic programming often makes simple jobs even easier... but makes medium jobs quite difficult and hard jobs impossible. This was probably hard to write, needed a lot of editing just to be a clear as it is, and yet is also hard to read. 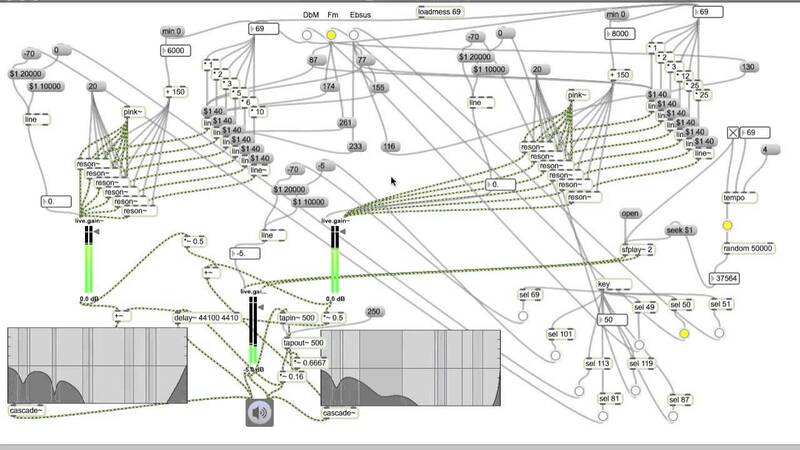 Pure Data (and an earlier, commercial system by the same author, Max/MSP), probably has similar recording and performance power accessible to the pop musician as CSound and Moselle. Like Moselle, and unlike CSound, it was designed to be easy to use. However... it failed at that goal. It has a fairly cryptic graphical programming paradigm which doesn't have much in common with the way musicians talk about synthesizers. The graphics explode like a nest of spiders once you have to do the equivalent of a simple mathematical formula of a dozen terms (such as a pitch calculation taking into account MIDI note played, tuning table, portamento, pitch bend and bend amount, pitch envelopes, vibrato, octave selection, detuning, special detuning for stacked voices, and the like. That's two lines in Moselle and a screenful in Pure Data. 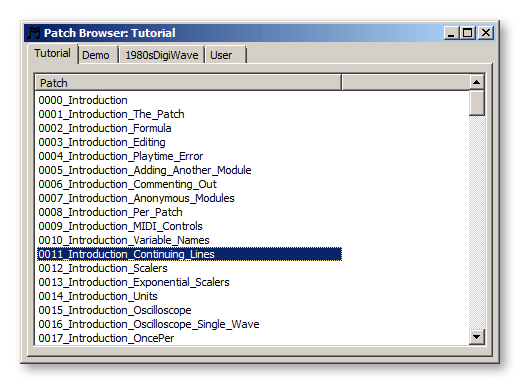 CSound is an old-timer music framework started in the 80s at MIT. We should consider the power to be ultimate, as it's not really finished yet. If you're a software engineer, you can keep adding more features. But for a pop musician, even a very technical one, that power is out of reach. It looks like it was designed to be easy for the computer, and easy for the people writing it. It doesn't seem like it is supposed to be easy to use for the people writing patches or performing with it. To its credit, it's 100% backwards-compatible: any patch you wrote in the 1980s will still work. However, that also means that a variety of bad decisions about usability made in the 1980s have never been corrected.